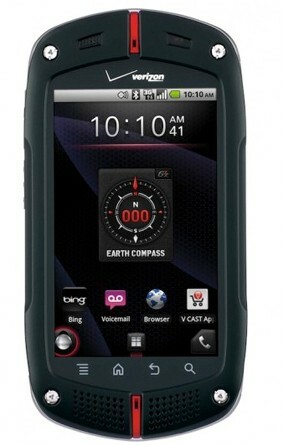 BASKING RIDGE, N.J., April 26, 2011 /PRNewswire/ -- Verizon Wireless and Casio today announced a new addition to the rugged wireless category and a new Android-powered smartphone in the marketplace, the CASIO G'zOne Commando™. Deployment ready, the Commando is a mobile office with high security features for secure corporate email; Wi-Fi for high-speed Web access; XT9 and T9 trace input for efficient typing; and snap-out menu for customized access to high-use applications. Designed to withstand the most extreme conditions, the CASIO G'zOne Commando easily transitions from work to play with advanced G'zGEAR software. As the ultimate outdoor tool in a mobile device, G'zGEAR operates in eight modes to enhance the active, adventure-driven lifestyle. With the help of its Triple Sensor technology utilizing direction, acceleration and temperature, G'zGEAR enables adventurers to perform at their peak. Earth Compass – Functions as a standard compass, the GPS shows the distance and direction to several domestic and international landmarks, including Yosemite National Park and Mt. Everest. Adventure Training – Takes training to a new level by allowing users to run with virtual opponents, like world-record holders, wild animals, or their own best personal performance stored in the training history. Trip Memory – Plots and records outdoor activities along with location information to share with friends and family on Twitter™ and Facebook®. Tides – Showcases the tidal graph for the day; time of tide ebb and flow; and current, past and future sea tide levels. GPS displays the nearest location map. Thermometer – Displays current temperature in both Celsius and Fahrenheit with numeric and graphic thermometer readings and compares the current temperature across multiple locations. Sun / Moon – Checks the time of the next sunrise, sunset, moonrise and moonset, and tracks the moon phases for your current location. Star Gazer – Utilizes GPS to display the stars and constellation names based on the current season and time. The CASIO G'zOne Commando will be available online at www.verizonwireless.com on April 28 for $199.99 with a new two-year customer agreement. CASIO G'zOne Commando customers will need to subscribe to a data plan. Unlimited data plans are available to customers starting at $29.99 monthly access. For more information on the CASIO G'zOne Commando or for other Verizon Wireless products and services, visit a Verizon Wireless Communications Store, call 1-800-2 JOIN IN or go to www.verizonwireless.com. Customers can visit www.CasioGzOne.com to experience the CASIO G'zOne Commando.